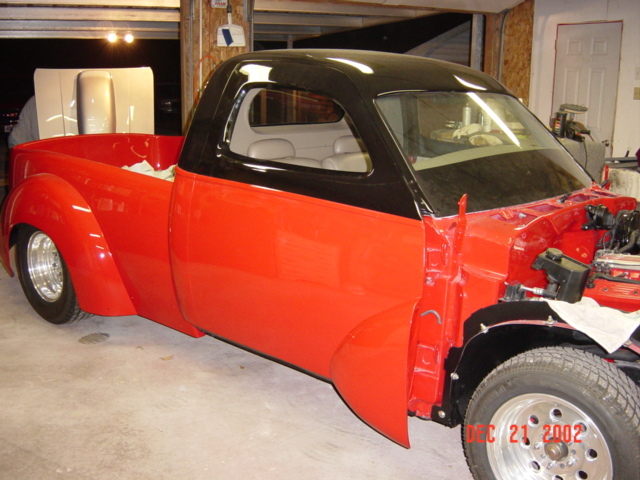 The truck is a 1939 Studebaker Coupe Express: Custom built street rod featuring a Street & Performance LT1 / 4L60E. Hand crafted by Terry Taylor of DeQuincy Louisiana. It is the official DuPont Hot Hues Sport truck which had it's sponsorship debut at the 2006 Syracuse Nationals. Since then it has exhibited at both the indoor show circuit as well as traditional outdoor events. It's a hit where ever it goes in both exhibition and competition, winning top awards from best in class to best hot rod. The Body is a first edition all fiberglass modified original based on a 1939 Studebaker Coupe Express by Master Street Rods. 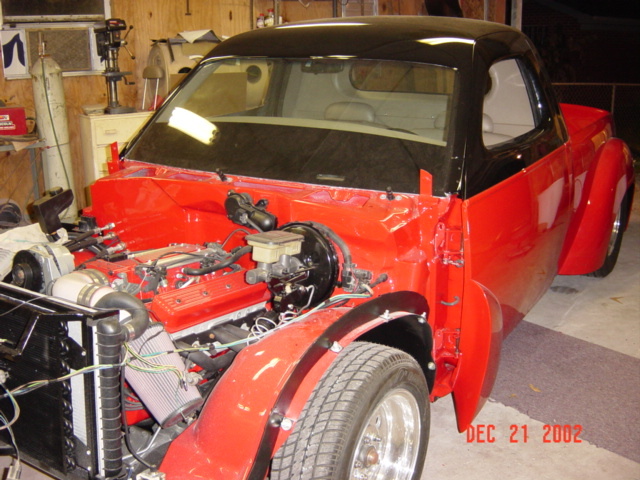 The radical style design is accomplished with: 4.5 inch top chop, 8 inch bed channel, 6 inch front clip channel, 4 inch bed section, Completely rolled & filled bed, and Lowered 2.5 inches in the front, 3 inches in the back. The stance is achieved with Weld Racing DFS Draglite wheels, Cooper Cobra tires. 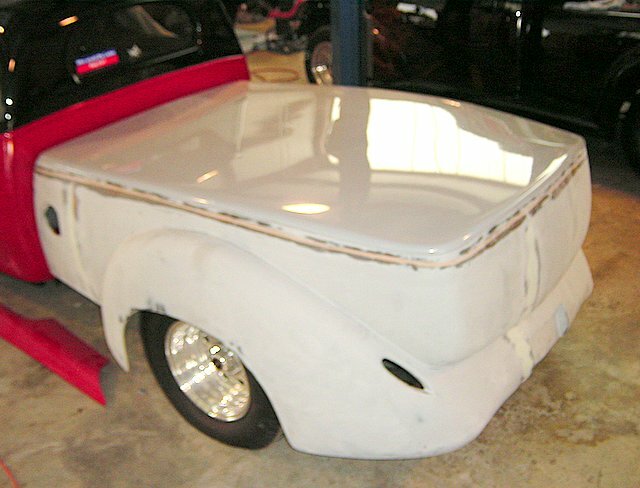 Other custom touches are: enhanced fender profiles, shaved & filled doors, integrated running boards, seamless cab, seamless bed ( all body lines filled ) semi-frenched headlights, original 1939 Ford glass lens tail lights, mahogany wood bed floor with stainless steel strips, and custom stainless steel laser cut grille. 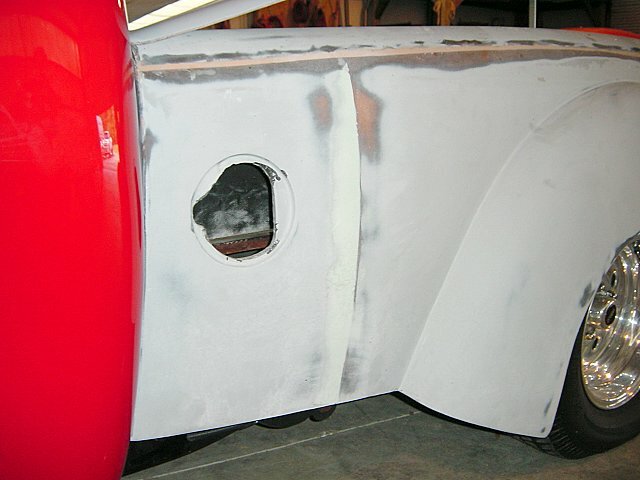 On this buildup the front clip has been modified from an original flip front to a conventionally opening hood with billet hinges and corvette remote latch. This is the only 1939 Studebaker buildup known to have this kind of set up. 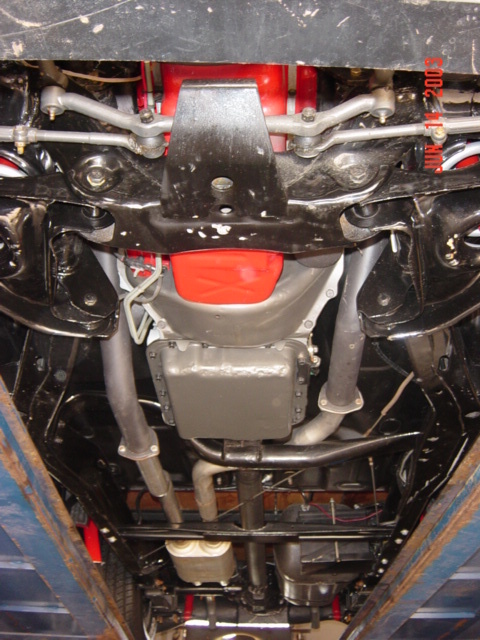 The body sits on a modified 1983 S-10 series Chevy truck frame that has been totally rebuilt front to rear with dropped spindles and blocked rear axle. 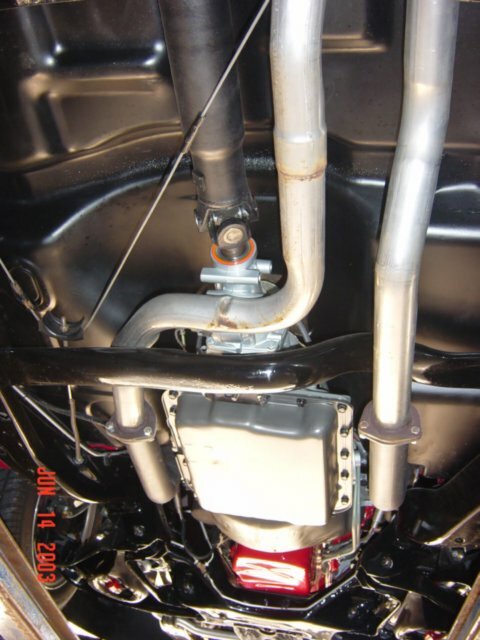 The exhaust is 2.50 piped into Flowmaster's dual 40 Series Delta Flow mufflers. The 40 Series generates a powerful, aggressive sound outside the truck with a lower interior resonance. With 300+ horsepower, this set up is a natural street beast with all the power you'd ever need. 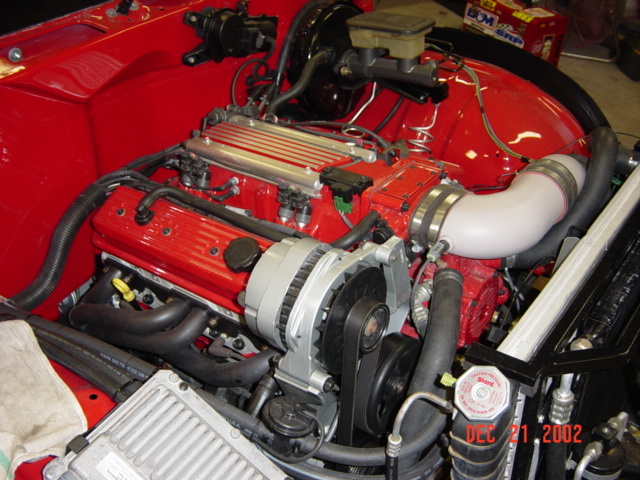 The engine tucks neatly behind the US radiator setup, tuned to kick in at 208 degrees. 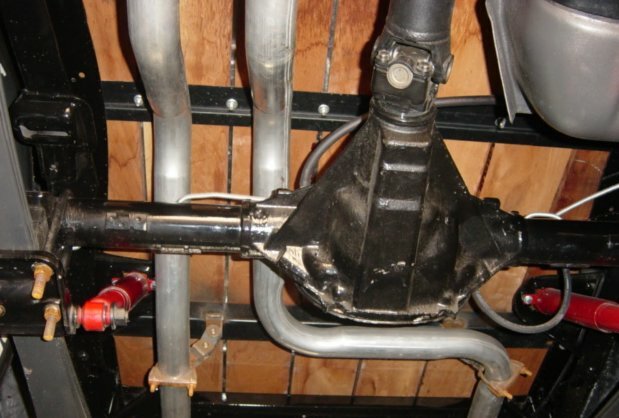 This custom matched setup handles both the engine and the vintage air, solving one the biggest problems with big engine hot rodding: adequate cooling. The motor box is about as clean as it can be. The only visible annoyance is the stock computer which basically runs the fuel Injection, cooling sequence and the transmission performance. The interior is totally hand fabricated with a one off custom metal dash that sports all Autometer vintage series gauges, flamed headliner, door panels, and leather seats, fixed mounted on hand built frame for ideal posture & driving comfort. 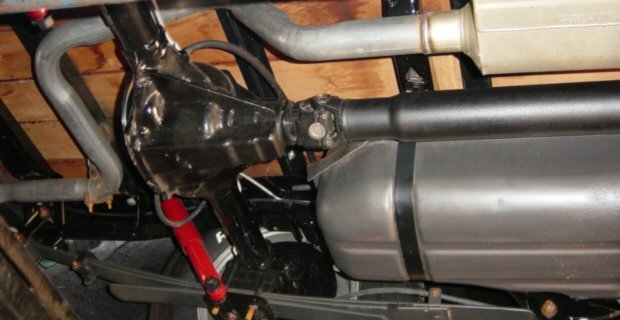 A/C by Vintage Air, All the standard vehicle controls are out of sight for simplicity of design. AM/FM/CD resides in the back wall - operated by remote. The Bed This gorgeous bed rework is not really so far away from the original appearance of the 39 Coupe Express. 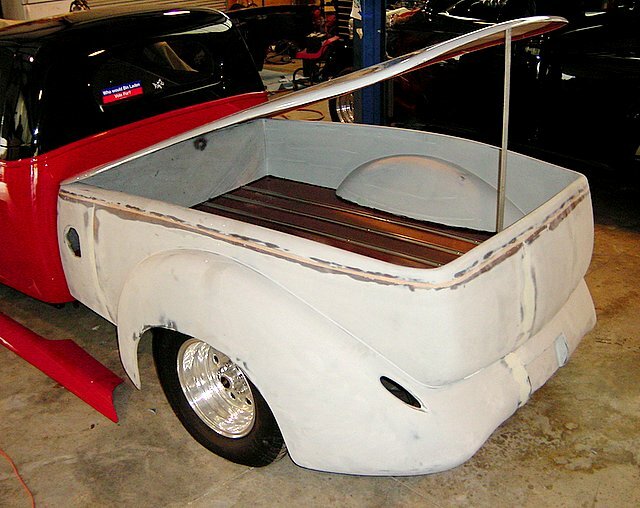 The Vintage Studebaker came with a fairly smooth custom looking bed back in the day when trucks used strictly for hauling. In keeping with the smooth, simple, & clean look, this custom bed sports all known design mods rolled in together� Smoothed tailgate, rolled pan, filled lines, molded fenders, custom tail lights, tubbed & raised bed & gorgeous mahogany decking. The deck is a nice throwback to the days when the early truck beds were decked with planks to accommodate the rugged utilitarian uses of the day. Fast forward to the custom of the modern street rod and the look is all new. 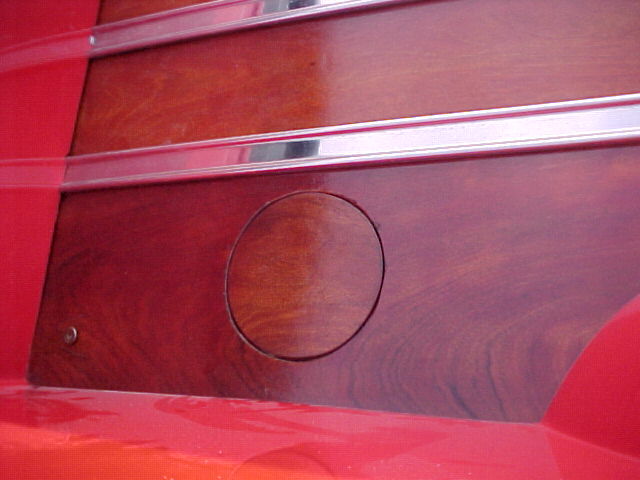 The bed deck here is � inch thick furniture grade polished Mahogany. This ride was made to be driven but one thing you wont see is this hauler with a load of gravel in the back! It has the capacity to be a daily driver. I have logged well over 5K trouble free miles since I bought it back in 2002. Since it's sponsorship with DuPont, it's enjoyed the life as a trailer queen and has been driven less than 500 miles total. 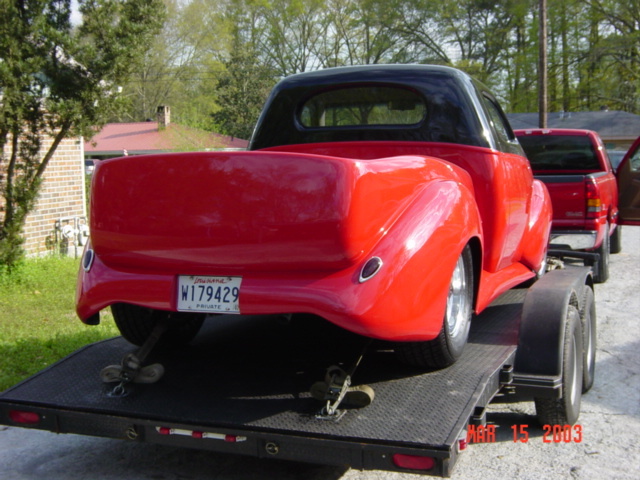 This is titled as a 1939studebaker. The paperwork is legitimate and clean. The engine is solid and sound but knocks a little when you hammer down, unless you use premium gas. When bought from Street & performance, it had 56K original miles on it so it's in great condition and barely over "broke in". 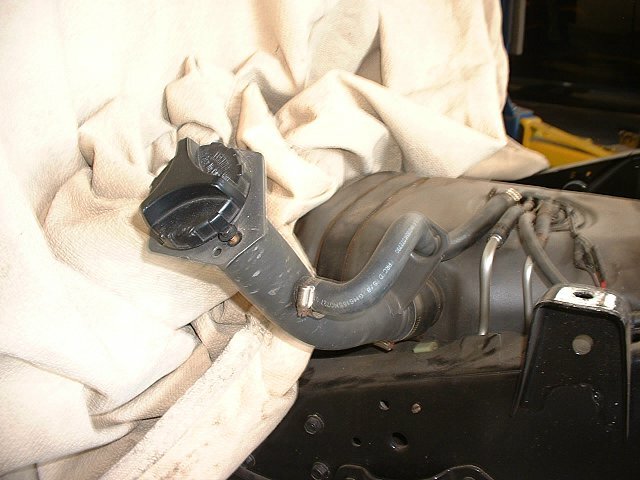 There is a minor engine oil leak when it sits static for too long at a stretch. The radio behind the seat is electrically temperamental, meaning that sometimes it works and sometimes it does not. There is likely a short somewhere along the way, a minor fix. The headlights are brand new but they are currently mis-aligned. They point down a little and need to be adjusted properly. 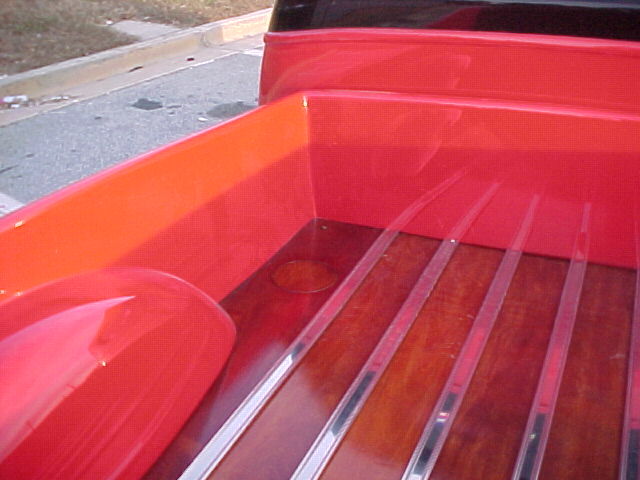 The battery box is accessible from the rear of the truck, just under the rearmost part of the bed. It is easy to get to for replacement, charging or a quick jump off if it sits too long. It has a OPTIMA red top gel type battery, 800 cold cranking amps. The truck drives straight with no lean, pull, or vibration. The truck is very quick and will boil the tires right off if that's the sort of thing you want to do. The top comfortable speed about 80. Mirrors: There is a driver side mirror and rear view, no passenger side mirror. Door pulls are new within the year, 80 pound autoloc. There is a mechanical locking emergency cable in the passenger fender well. Turn Signals: There are no front turn signals but the original harness wires are available should one prefer to add any type of lights for front signals. I do have two of the original S10 signal lights which are designed to be inserted into the grille. I did not prefer the bulky look of this under the hood. The gas filler is normally on the driver side of the bed but I thought it looked better to not have it visually interrupt the look so it was moved. It is s hidden in the bed with a round cutout that cleverly disguises the filler cap. As far as I know. this is the only 39 with this custom feature. Fun noise: I have an accessory siren and school bell for fun. The switches are beside the drivers seat. The steering wheel is vintage banjo style although the photos show a grant classic spoke. The banjo is more fitting for the period not to mention that it is a superior quality wheel. On the DuPont sponsorship, It is scheduled to end July 31 2007. At this point there are no plans to renew it for another season. If the buyer prefers, I will negotiate with DuPont for another season but that may obligate you to exhibitions and appearances that you may not wish to participate in. Your personal web site: The existing web page for this truck will be tailored to the buyer's specific ownership. While you will not be given the ownership of the actual URL (web address) you will have use of the site as your personal identification with the truck. It will be your personal album to share with your friends and colleagues. Marketing materials: Many print pieces have been developed for the truck for it's marketing in conjunction with DuPont, the ISCA, the Right Coast Association, and others. All of these formats will be made available to the buyer for their preferred use. Some official photos are available but for the most part, any promotional photos and use is the copyright of the sponsors. Awards: The buyer will also receive the actual awards received for the truck. The set includes some plaques & new styled trophies and the like. As a feature vehicle, most shows and exhibitions were not competitive or the truck waived entry as a competing vehicle so there are only hand full of actual awards, all of which are top awards. The buyer will receive all of them. Can't think of anything else! Please send whatever questions you may have. Jeff Nix 678-776-8861 or jnix22@bellsouth.net If you want specific photos of anything, let me know and I will post them to the picture pages HERE If you'd like us to build one of theses unique street rods, inquire via email or phone. You are welcome to come see the truck in Metro Atlanta Ga. I will meet a prospective buyer at their convenience. To arrange to view or just to ask questions, Please email me or call jeff. PHONE 678-776-8861. I am on Eastern Standard Time. The truck can be stored until you are ready to pick it up.